True story: I accidentally created the best sausage recipe in the land last week. 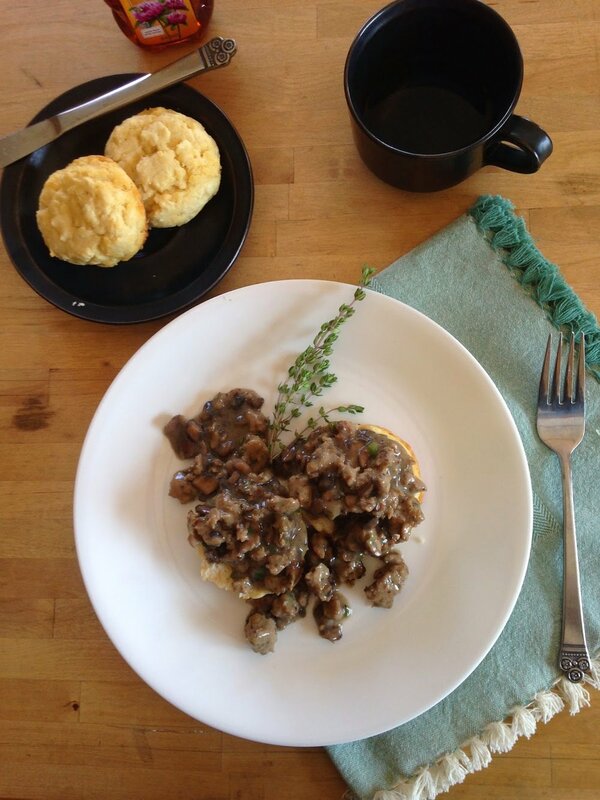 I made a huge batch, so I thought I'd use some of the meat to make an umami-rich biscuits and sausage-mushroom gravy brunch. It's one of my fiance's favorite breakfasts when we go out and it was his birthday, so I marked the occasion with this food. The gravy is mighty good, folks. Mix almond flour, baking powder and salt together. Cut in cold ghee with a fork until the mixture is crumbly. Chill the mixture in the fridge for 10 minutes. In a separate bowl, whisk egg whites until they are frothy. Fold the egg whites into the chilled flour mixture until well combined. Scoop about 1/4 cup of dough onto the baking sheet and shape them into 4 biscuits. Bake for 15-18 minutes, or until the tops are golden brown. Add the mushrooms until cooked. Add thyme, chives and sage and fry for a few minutes more. Slowly stir in a can of coconut milk. Bring to a simmer. Mix a slurry of arrowroot powder and cold water (just like you might do with cornstarch) and whisk it in slowly to thicken the gravy. Use as much or as little arrowroot powder as you need to get the consistency you like. Add salt, pepper and crushed red pepper to taste. Spoon on top of the biscuits! The same herbs are used in the sausage seasoning too, so just set a little aside to use in the gravy if you're planning on making this. I was worried the gravy would be too coconut-y with the coconut milk, but all the savory parts of the sausage and herbs cut that flavor.